Wow. That had to be a a little persona, right Coach? Vrabel on throwback to Mariota, just after NE threw to Brady: "I wanted to see if ours looked better than theirs." Smirks. Aaaaaand on Monday the Bills finally cut Peterman. And it was a surprising victory for the Browns over the Falcons when Nick Chubb EXPLODED. Nick Chubb with the longest run in Cleveland Browns history. 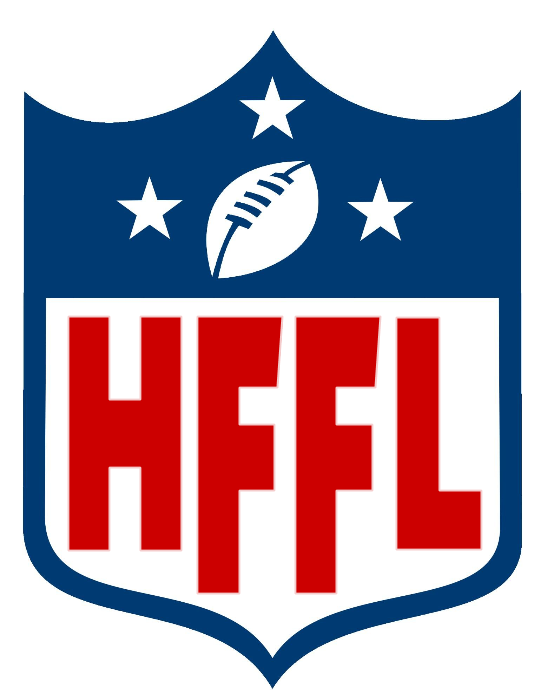 In the HFFL, the playoffs are fast approaching and teams are desperate for wins. And this week we actually have our first playoff clinchers! Let’s break it down! Guy Grenouille is in the playoffs. After another big win this week, Dan’s squad is at 9-1, which is enough to separate him from the pack. With a 2 game lead now over 2nd place, it’s hard to imagine him not getting one of the top two seeds and a first round bye. We’re almost out of superlatives for this team! The LOC had lots of close games this week and many that were decided on Monday night! Bella’s Boxers used Matt Breida’s big game to get past Spacegoat by 10. Ron noted that he’d been shopping Breida lately and was glad his offers were rejected. We also say Nana Nancy pull off an upset of Real United FC when Robbie Gould couldn’t deliver one more FG on Monday. Tyler won by 1.02 pts over Andrew, who really wishes the Jets could have stopped the Bills. The Jets D got him -3 pts. The top teams in the PL keep winning, but the parity we’ve see all year continues. We’re 10 weeks in and no one has clinched a playoff spot. Which means that even the top team could still go on a slide and miss the playoffs entirely. And we’ve got FIVE teams all sitting at 5-5. The playoff cut line is going to be really brutal in the PL! Decimal scoring comes through again. Diddy managed to get by Mr. Marble this week by 0.2 points when Saquan Barkley ran for 10 pts on Monday night! Just amazing. But consider this: Jim is averaging the ninth most points per game in the PL, but he’s 7-3 and in 3rd place overall! Unbelievable! When the Prophets and Cieras tangled this weekend, it had HUGE playoff seeding implications and could have been an EL Super Bowl preview. But the Prophets took some drama out of the actual game by getting 35 from Big Ben and running the Cieras out of the stadium. Joe clinches a playoff spot and Pastor Chris is just hoping to keep pace for the next 3 weeks. After getting his first win last week, Mr. Rodgers got almost doubled up by Kamara Shy this week. This drops him to 1-9 on the year, so it might be time to look at how to fight his way out of the Toilet Bowl bracket rather than ascend to the real playoffs. On the other hand, Liams Dream Team capitalized on last week’s HFFLUBTotW award by winning again! That’s 3 in a row and he’s positioned for a playoff push! Seven straight wins!? That IS fantastic! Luke’s team started 0-3 and has had the dead weight of Le’Veon Bell on his roster ALL YEAR. As reports surfaced this week that Bell may not play a single down this season, Luke consoled himself with 30.30 pts from David Johnson and 36 pts from Mitchell Trubisky! It’s another Bye-Pocalypse this week with six teams out of commission. The Bills, Browns, Dolphins, Patriots, Jets and Niners are all off the table. Thursday will find the Packers heading to Seattle, which is always a contentious matchup! And the Vikings and Bears game has been flexed to Sunday night! Huzzah! And that’s really all there is to say! Three weeks left in the regular season, gentlemen! Make them count!